Since the day we are born, we are bombarded with the contradictory claims that our lives are predestined and that Fate deals us the cards we must play, or that our lives are the results of our choices and that we shape it as we go along. Destiny vs. Choice examines the philosophical, spiritual, and scientific evidence for both claims, and shows us how we can live better, more fulfilling lives no matter which side ultimately “wins” the debate. 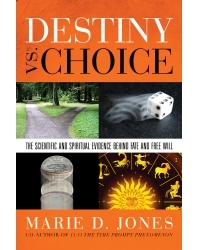 Marie D. Jones is the best-selling author of The Déjà vu Enigma, 11:11 The Time Prompt Phenomenon, and 2013: The End of Days or a New Beginning? She is also a screenwriter, radio show host, and popular public speaker who has been interviewed on hundreds of radio shows all over the world. She was recently featured on The History Channel and is a regular contributor to TAPS ParaMagazine and New Dawn Magazine. She lives in San Marcos, California.